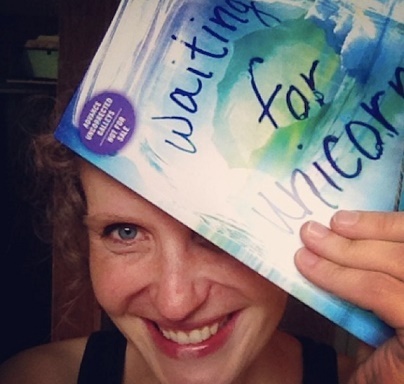 ARC Giveaway: WAITING FOR UNICORNS! Some fun on the blog this week! In honor of the approaching thankful season, I thought it would be all kinds of awesome to do a giveaway here at swirl and spark. And since one of the things I am so very thankful for is all of you, I want to give you an opportunity to share something you’re thankful for and… a chance to win an ARC (Advanced Reader Copy) of the new middle grade novel by debut author, Beth Hautala—WAITING FOR UNICORNS! All you have to do is comment on this post. Share with us one (or more) things you’re thankful for. It can be writing related, book related, or something completely different like congratulations to Beth or something!! Then next week I’ll draw two names from the comment box. Each person will receive a free advanced copy of Beth’s book which will be released in January 22, 2015! Beth was sweet enough to send a copy to me and two extra copies to give away on my blog. For those of you who don’t know, an Advanced Reader Copy is the copy from the publisher in the very last stage before it’s about to published for its release date. It looks exactly like the real book will look except for any last minute typos the editor will catch right before final printing. To enter for a chance to win one of the two ARCs, please leave your comment below. I’ll take comments until Tuesday at midnight EST and post the winners next Wednesday. In one of my future posts, I’ll have an interview with Beth to share with all of you too, so yes… more great WAITING FOR UNICORNS fun to come!! I am thankful for my awesome critique group, Writer’s Inc.
Oh! This sounds so amazing!! Congratulations, Beth! What a great shot of a dream come to life!! I’d love to read this!! I can’t even imagine how thrilled you are to finally hold those words in your hands! So awesome!! This one sounds absolutely gorgeous– and I’m not only talking about the cover! Love the fact that it’s got Inuit legends and traditions (by the sound of it with the Narwhal), something that isn’t unfortunately covered enough in Middle Grade or Young Adult fiction. Books like these really make me thankful for authors who are looking to tell stories of diversity 😀 I’m really looking forward to this one, and thanks for the fabulous giveaway!